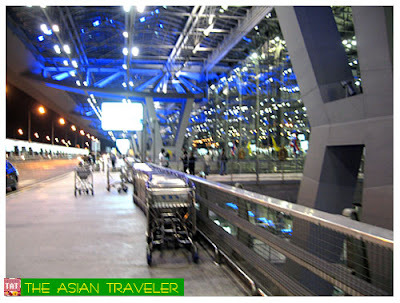 Suvarnabhumi (pronounced as "su-wan-na-poom") means "The Golden Land" is also known as New Bangkok International Airport. 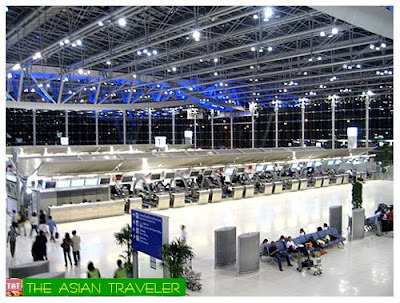 It is Bangkok's main airport for all Domestic and International commercial flights. It is said that Suvarnabhumi Airport has the world's tallest control tower (132.2 m), and the world's third largest single-building airport terminal (563,000 m²). The steel and glass terminal is very spacious with seven levels and seven concourses. 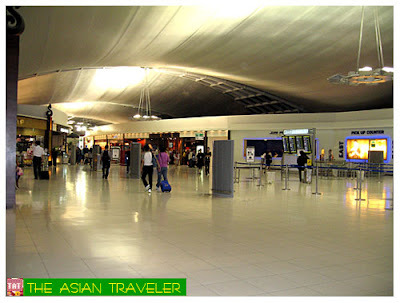 Generally, it's a well-lighted airport with clean facilities. On our departure, everything went pretty smoothly. We entered through the entrance on the Level 4 of the Departures Hall. 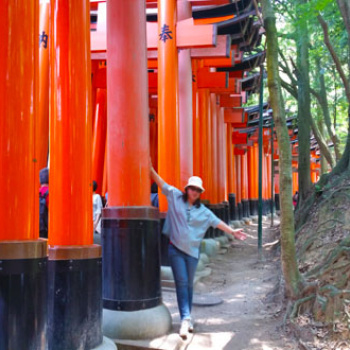 After checking in, we passed through the customs control checkpoints. 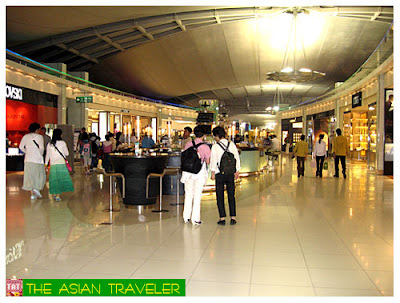 As we entered the International Departure area, we were overwhelmed by its vast size with numerous retail shop options; it's like a large shopping mall. However, travelers should learn how to spruce up a space without breaking a wallet because this area abounds with strikingly designed boutique shops of Bally, Burberry, Bvlgari, Cartier, Coach, Dior, Swarovski and along with many other Internationally known luxury brands. On the downside, you have to do a lot of walking here before you can reach the Departure gate. Plus there are also inadequate concourse seats and comfort areas pre-security. 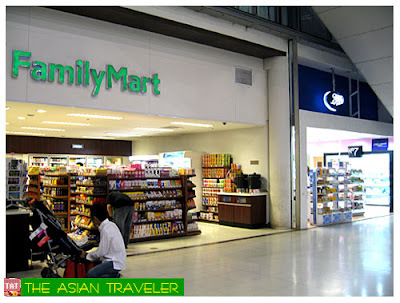 When we went through the Security Checkpoint, our bottled water purchased at Family Mart was confiscated. The drawback here is that after passing the Security you won't find any refreshments on sales or any vending machines for beverages. I waited dreadfully for more than 3 hours until boarding time with no drinks at all. Not to mention the extremely cold temperature coupled with hard metal seats was really discomforting. I hope the Airport Management will do something about this. 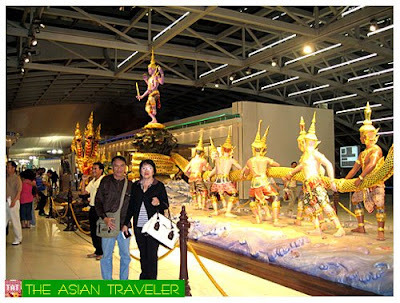 The Bangkok Suvarnabhumi Airport is located in Racha Thewa at Bang Phli district, Samut Prakan Province, about 25 km east of downtown Bangkok. A car ride will take you less than an hour to and fro the city. Nice airport. Remind me of the Kuala Lumpur International Airport for the long walk. Also a bit surprise you can't find bottled water after the security check point. thanks for the very informative blog! this could be a lot of help when i decide to go to thailand. And Suvarnaboomi is a Sanskrit word ! We pronounce it here as "Swar-na-boo-me"
I especially remember the out going flight. I've never seen a larger concourse. Even Madrid seemed small compared to this one! 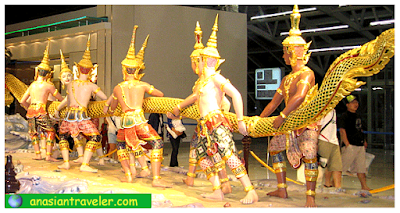 I just went to wiki and learnt more about Thailand and the Thai culture :) Sorry for calling it a Hindu country.. I learnt its a Staunch Buddhist country , but Thai Buddhism called "Theravada" has included many beliefs originating from Hinduism , which mislead me ! :) Afterall , Lord Buddah was born in india - the place were Buddhism originated. I don't know but I just consider this as just a big airport. Nothing special that would distinguish itself like HK, KL or Singapore. I can't say much about Kl International Airport. 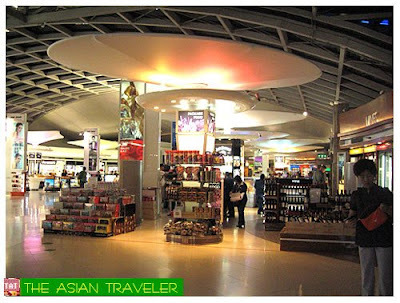 On our trip to Kl from Manila, we traveled via Air Asia, the low-cost airline that uses the LCC Budget Terminal. Whew, that was fast! You never gave me the chance to explain it. Good thing, you've corrected yourself and clarify everything. Very true and very well said.